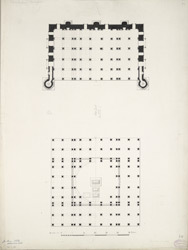 Plan of the mosque at Isanpur, near Ahmadabad from James Burgess' 'Original Drawings [of] Muhammadan Architecture of Ahmadabad.' Isanapur, is located on the west bank of the Sabarmati River, north-west of Ahmadabad near the mosque of Bibi Achut Kuki. In 1460, Sultan Mahmud Begada (r.1459-1511) dedicated a mosque and a tomb in memory of Sayyad Usman (d.1458), a son of the saint Qutb-al-Qutab Burhanu'd-din of Batwa. The mosque is the first example in Ahmadabad where the minarets have been relocated on the façade from the middle section to the ends.